We enjoyed our time at Timothy Lake South Thousand Trails, near Stroudsburg, PA. This is a large campground with plenty of nice, full-hookup, 50 amp sites. The roads are all paved and wide enough for RVs. There are many pull-through spots as well as a great number of back-in sites around the parameter. Generally speaking, the campsites are plenty long enough for even the biggest rigs. While they aren’t exactly on top of each other, the sites are pretty close side to side. Many big rigs head for the “top” where there is plenty maneuvering room and no trees to block rooftop satellite dish usage. If you pay attention many of the shady pull-through sites will also work just fine. The pool is a nice one and well used, especially on the weekends. While the restrooms in the Activity/Store building are nice and well-kept I was disappointed in the condition of the others. They were worn and often in need of cleaning. My Verizon data was slow but usable most of the time. However, we opted to pay for campground WiFi for the week. It was fast and reliable. Also, I was able to get my Dish satellite signal with no problem. 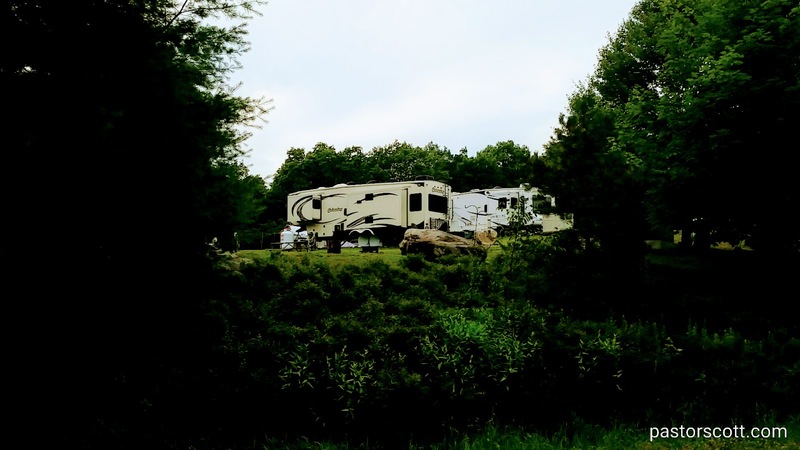 While there are plenty of campsites, it should be noted that a lot of sites have been taken by seasonal campers, especially around the outside roads of the campground. The area just to the southeast of the office has many park models, although if you look through that area you will find a few campsites scattered among them. I wouldn’t bother looking for a spot there unless the campground was especially full. The drive in (and up) from Hwy 209 merits a mention. The roads, Winona Falls and then Timothy Lake are narrow and pretty steep. When coming in pay particular attention when turning off of Winona Falls onto Timothy Lake. Oncoming traffic on Winona Falls isn’t visible until you are right at the the left hand turn. That traffic doesn’t have a stop sign. When leaving the campground that same intersection puts you at the bottom of a steep hill, requiring a full stop before turning right onto Winona Falls. In other words, keep your transmission in a low gear and keep your speed way down. Then, be sure you can see traffic coming from your left before committing to the right hand turn. Having said all that, I don’t want to scare anyone about coming to this campground. The route in from Hwy 209 is only 3 miles and literally thousands of RV’s have made the trip in. We really like Timothy Lake South. In fact, we’ll stop off at this campground again in a bit over a month as we head south again.